Move aside tapas – pintxos are the Spanish-style snack of the day. You pronounce it “peen-chos”, which is phonetically close to the Spanish spelling “pincho”; pintxo is the Basque word. It’s differentiated from tapas firstly by its origins in northern Spain and being especially popular in the Cantabria, Asturias, the Basque country and Navarre; and secondly by the fact pinto/pintxo translates to “thorn” or “spike”, which describes how the morsels are presented, often speared to a piece of bread, but not always. 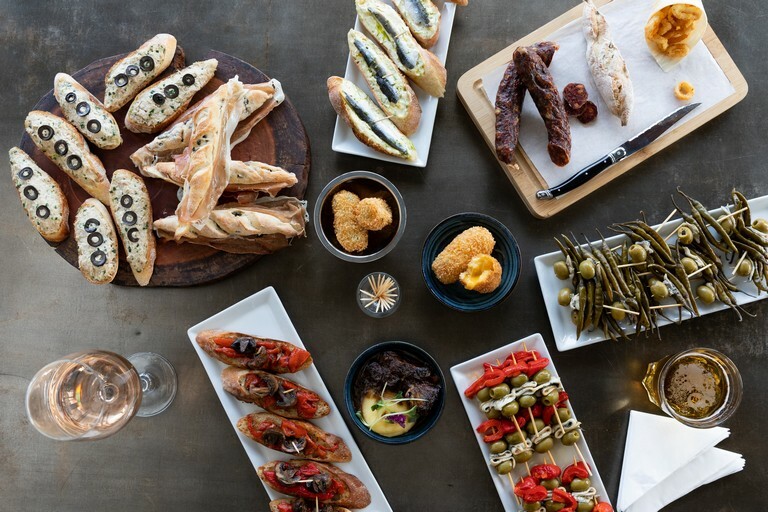 Sotano On Bree has launched a Pintxos Bar, which is available daily from 4pm till 7pm. Similar to tapas – although much smaller and of course on the skewer – these little nibbles are usually enjoyed as an in-betweener – something small with your first glass of wine, or a tummy liner on your way to bigger dishes. Of course you can make a meal of them; no one is stopping you. At Sotano, each pintxo is individually priced, from a very reasonable R8 upwards. Served at the bar counter on the ground floor of the restaurant, the staff are on hand to explain how it all works. On top of the glass display is a platter of samples to give you an idea of what to expect – lots of olives and lots of white anchovies. These are the Gilda skewers: green olive, white anchovy, tiny green chilli. Then there are green chillis and anchovy; green and black olives with stuffed peppadews; anchovy, green olive and red pepper; and black olive, red pepper and chorizo. After the sample I stayed away from all the chilli ones, but that still left plenty upon which to feast, and in the interests of this story, we tried almost everything. Attached to bread I had the hardboiled egg with prawn and salmon roe, as well as the anchovy with cream cheese (delish); my friend had the marinated bell peppers with mushrooms, twice. I loved the little bowl of octopus with marinated peppers, and my friend was equally enamoured of the ham and cheese croquettes. Other items on display include prosciutto on a mini olive baguette, tuna remoulade and sliced black olives on bread, cured meats sliced to order and priced by weight (including Richard Bosman’s prosciutto), hake croquettes, and cones filled with battered fried calamari. You can also order two warm dishes – marvellous wild mushrooms with an egg yolk nestled in the middle, and beef shin with mash. Sadly, this wasn’t available on the night we visited because the chef deemed the quality of the meat to not be of a high enough standard – which we appreciate. There are no desserts as such (only a la carte upstairs), but we ordered cocktails, which were the perfect liquid ending to the meal. The Stout Martini is not too sweet, being a concoction of Kahlua, Absolut vanilla vodka, Bottings Chocolate Stout, espresso, cream and grated chocolate – yum! There are a few wines available by the glass, including Chubby’s Rosé Sundays. As it turned out, we polished off a bottle, which has a very pretty label. * Pintxos Bar at Sotano is open from 4pm until 7pm, daily. Find Sotano at 199 Bree Street, Cape Town. Call 021 422 0567 for more information. Other specials include two lamb burgers for the price of one on Wednesdays, from 7pm until 10pm, with live music by The Rivertones, and a daily beer special.